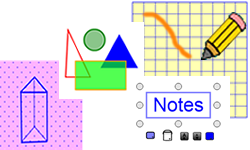 The Notepad tool provides a vehicle for students to write solutions, sketch diagrams, create graphs and record their mathematical thinking. Four backgrounds are available: blank paper, grid paper, isometric dot paper and lined paper. Begin by choosing a background in either a windowed or non-windowed mode. The French localization of the tool is called "Bloc-Notes" and can be accessed using the switch language button at the top right of the opening dialog. Access a wide variety of Annotation tools to communicate thinking. Insert pictures into the tool. Work created in a mathies tool can be saved and opened . A saved file can be shared with peers or submitted to a teacher. The file will contain all solution steps from start to finish. Take a screenshot to use as part of a portfolio, presentation, web page, etc. Use unlabelled number lines with text labels to represent decimals. Lori is putting together a relay team to run a race. She will complete 1/2 of the run. Her friend, Zach will complete 1/10 of the run. If she asks some of her friends to run part of the run, what fraction of the run will each friend need to run? Use a number line to represent the race and the different distances that were run. Adjust the number of divisions to think about different ways to partition the number line. Adjust the initial value and/or the interval size to explore various linear expressions. Notice the connection between composition of functions and order of operations. 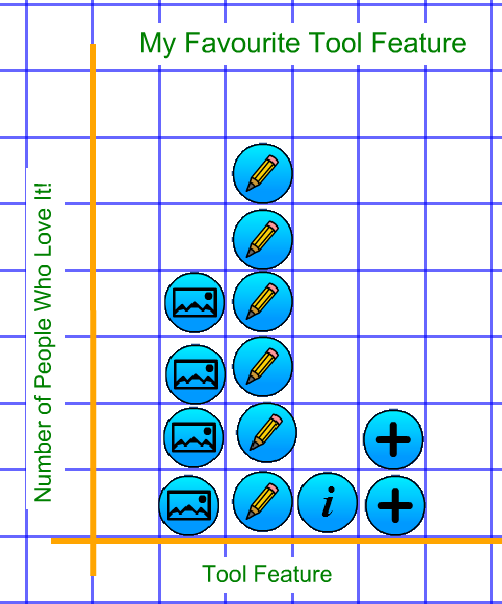 Use number lines to quickly create axes. Use the annotation rulers to determine the length of the hypotenuse in terms of grid squares. In this file, the window size may need to be adjusted so that the ruler exactly matches the grid background as in this image. Use the annotation grid to mimic base ten materials. Copy the flat, rods or unit grids to represent various numbers. Shade parts of the grids using the annotation tools. Sky has 3 granola bars to share with her friends. She'd like to give each person 2/3 of a bar. How many friends can Sky share with? In groups of 4 students weighed and measured pumpkins. They then estimated and counted the number of seeds and filled out a collective table. The picture was imported into the Notepad to show how students were grouping their seeds by 10s to make counting easier. After completing the data collection, a screenshot was taken which can then be imported into the Notepad. 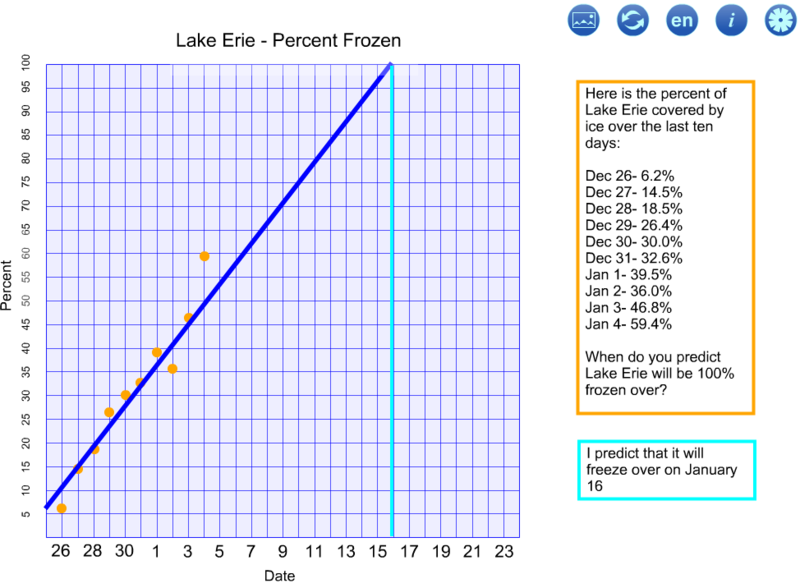 This is an example of a graph that could be created by intermediate students based on data collected above. This video was developed by Dave Petro and Gisele Jobin from Windsor Essex Catholic District School Board. add the mathies sample files Google drive folder to "My Drive" which allows convenient access on all devices. See the File Operations page for more details. Shows a dialog with a link to this support page, a feedback form as well as copyright details and version number. Switch between English and French. Delete all work and return the tool to its starting state. Insert images into the tool. More details. See an example of importing a Geoboard image. Swap the background and image layers. Use elements of this panel to draw, write and type. The wide variety of Annotation Tools can be used to communicate thinking. Several new drawing objects have been added as of Fall 2017. Make a copy of the selected objects. Videos are provided in two formats to allow for use on a greater variety of browsers and devices. Note: There have been significant improvements made to the annotation tools since the video was produced. The annotation video referred to in the video is not available. See the annotation support page instead. Visit EDUGAINS for various Manipulative Sheets.